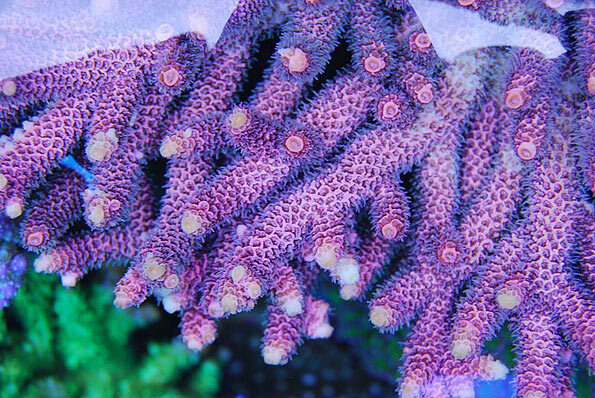 To start off, I would like to thank Reef Central for the chance to represent Poland as a country where saltwater aquariums have been kept at a high level for several years. 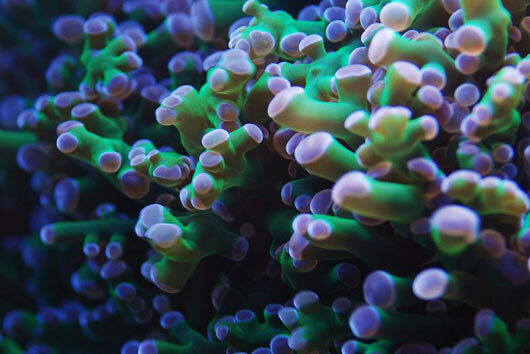 Here in Poland we have many talented aquarists with great knowledge, commitment and unlimited access to the best European products, implements and equipment. 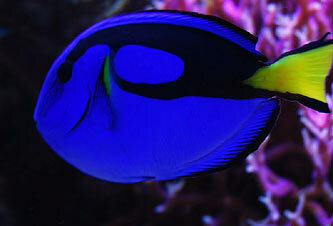 My tank is not the only one that can enchant. It is only a matter of time before others will be presenting here as well. The chance to share my passion with you is a great honor for me. Especially since mine is the first Polish tank to be featured as TOTM. Five years ago I wouldn’t have dreamed of being chosen. My name is Szymon Jankowski, I live in Starogard Gdanski, a small town in the north of Poland, nearby the Baltic Sea. 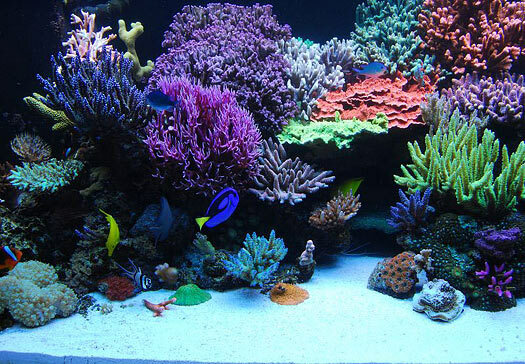 I’m a pharmacist and I’m addicted to reefkeeping. 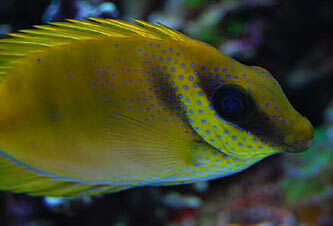 My adventure with saltwater fishkeeping started about five years ago, when I met my great friend Rafal Kosecki. 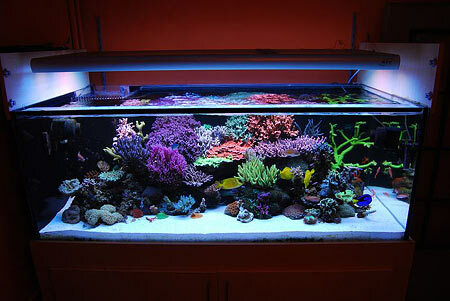 He has an approximately 200L (~50-gallon) tank with softies and some fish. 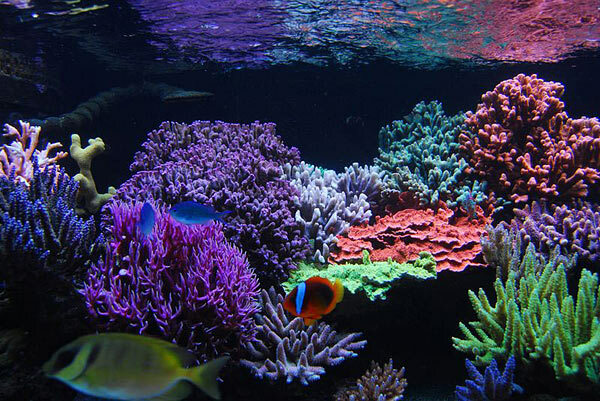 The very sight of the pulsing Xenia and the fabulously colorful tangs did not let me sleep well, and as everybody knows, one has to sleep. 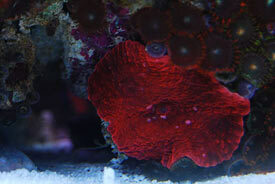 In one month, the first simple saltwater tank was in my room. As I was gaining more knowledge and experience, an appetite for something more and bigger was slowly growing. The crucial moment was while visiting my friend Andrzej Niewiarowski who is a great and gifted reefer that to this day is still a great resource. 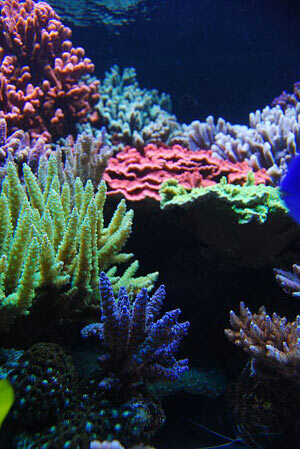 His 1200L (~300-gallon) SPS tank made such a strong impression with me that in order to cure my recurring sleeping problems, I decided to set up the tank of my dreams. 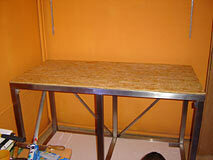 Collecting the implements and designing the whole system took me about half a year. I set myself a goal to never ever resort to half-measures. Everything started in December 2006. 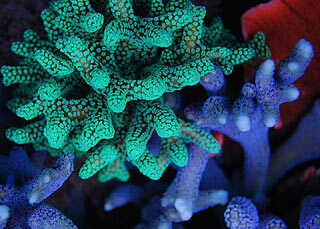 Today the hobby is my lifestyle and an important part of my existence. 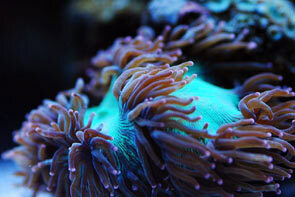 I can’t imagine a day without even a few fleeting glances at my reef tank. The main goal of my system is to use the least amount of energy possible. 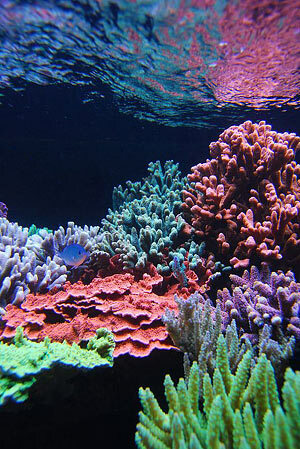 I feel strongly that preserving the resources we have is our responsibility. 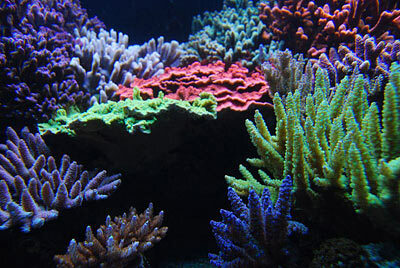 The 160cm x 78cm x 60cm (64” x 31” x 24”) tank is made of Optiwhite glass and is absolutely clear which I think is of great importance for observing the correct color of SPS corals. The base is constructed with a very strong rack made of acid-resistant steel surrounded with wooden boards on the front and right side. 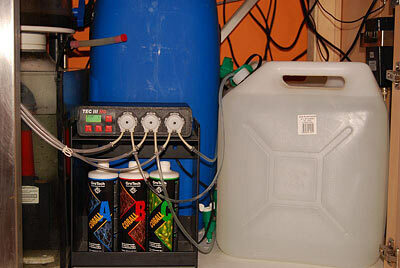 Beneath the tank, an approximately 200L sump holds all the equipment and accessories. I don’t have a separate equipment room; for me simplicity is key. 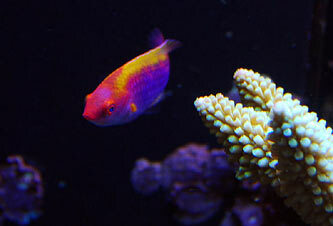 I am of the opinion that isn’t a large amount of equipment that is crucial for success, but rather your skill in maintaining the tank as well as good observation skills are what truly make the aquarium. 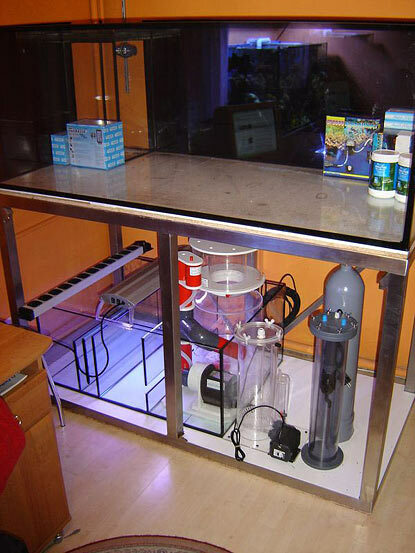 The first part of the sump contains the Bubble King Royal Exclusive internal 300 protein skimmer. 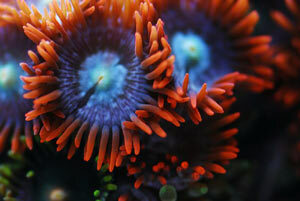 It is the heart (of the system) that allows us to feed corals and fish as much as they and we want to. 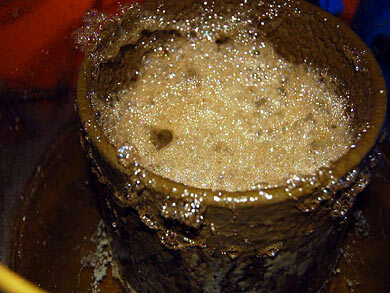 The second section of the sump is empty, housing only a sock filled with activated carbon - for me it is absolutely necessary: it purifies water by removing toxins and all the organic substances that color the water. 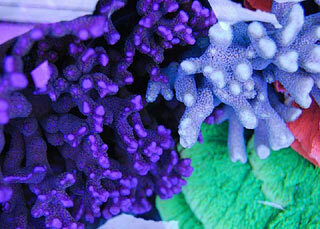 Using activated carbon increases light penetration and raises the redox potential level. 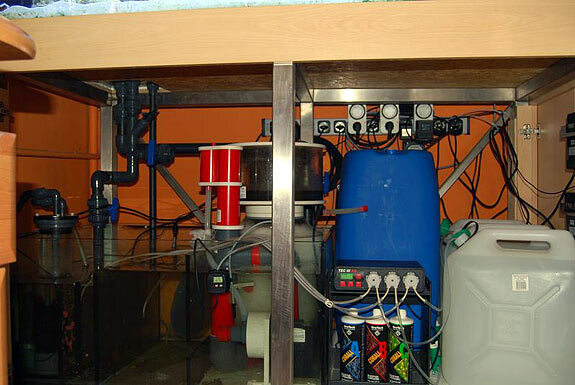 In the final section of the sump there is a Rowaphos filter and a Red Dragon 6500 return pump, which is responsible for moving the water back to the main tank. 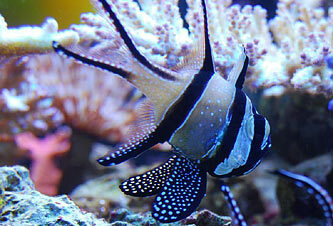 The skimmer, about 90 kg (198 lbs) of live rock, and a 12cm (4.8”) deep sand bed are responsible for filtration. 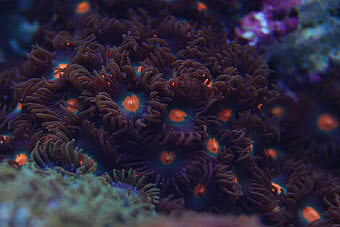 In the first few months I used to have a refugium with Miracle Mud, but later I got rid of it. It may be a good part of the total ecosystem, but in my opinion it is not really necessary. 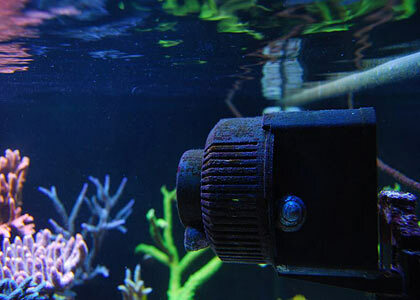 In the main tank, I have two Tunze 6100 Stream pumps connected to a Tunze Multicontroller. 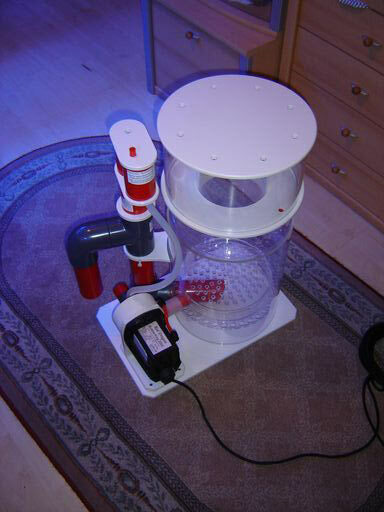 The water movement is assisted by the Red Dragon 6500 (return pump) entering the tank via locline fittings. 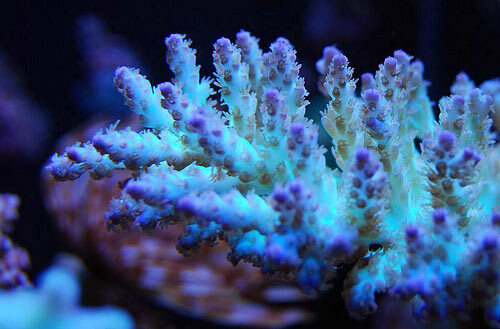 In the near future I will have to increase the water circulation as the corals are getting bigger and bigger, which causes the total efficiency of the water flow to decrease. The lighting is probably the longest story, and the most discussed subject on all forums. 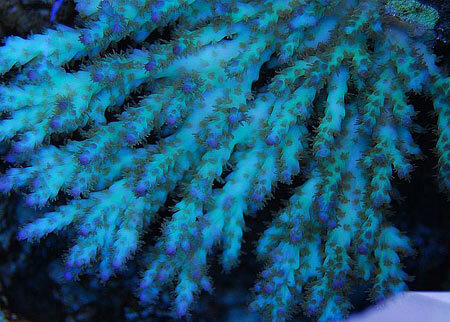 Actually, I am not surprised by this fact, because proper lighting is one of the most important elements of success if you want the color and growth of SPS corals. 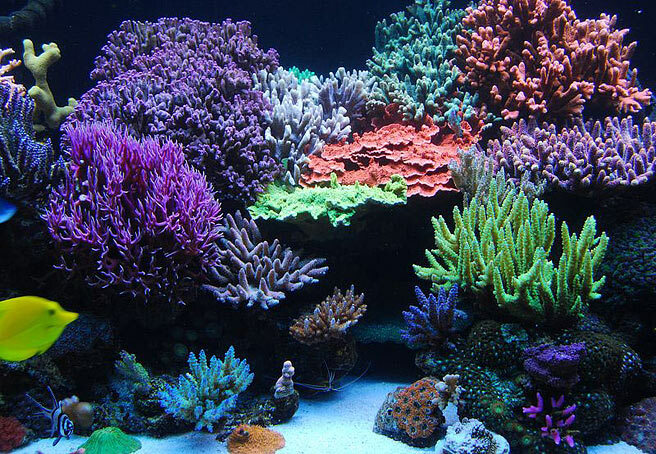 In my career as a reefer I have probably tested out almost all the possible combinations of light and lighting to find the perfect solution both for me and my tank. 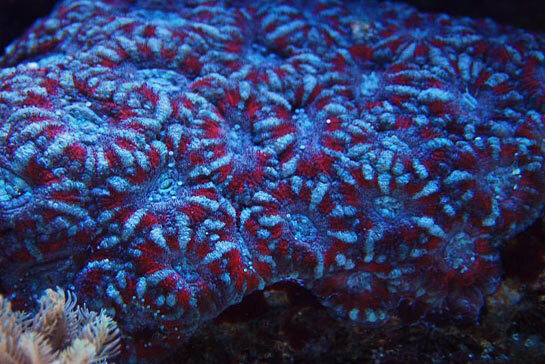 During the first eight months I used HQI metal halides with T5: two 250W 13,000K Giessemann bulbs and the combination of Blue Plus and Blue Actinic ATI T5 fluorescent lamps. 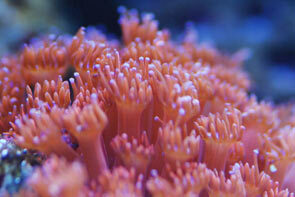 The low Kelvin rate helped perfectly with fast coral growth, and during those 8 months the results were really superb. I never used human growth hormones. 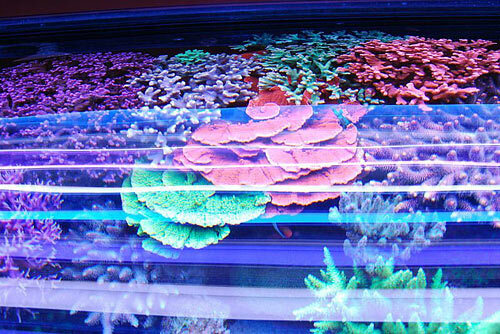 Then I decided to raise the degree of the corals’ coloration, and installed BLV 20,000K bulbs in an Aquaconnect lamp. 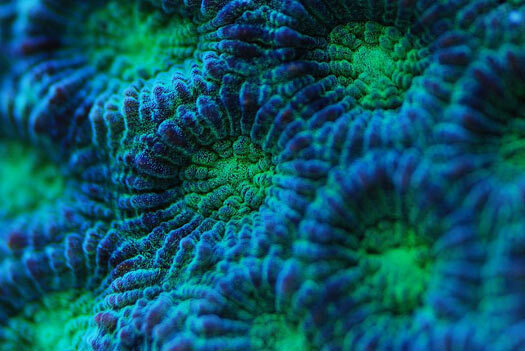 The colors turned stronger and brighter, but the growth was somewhat inhibited. 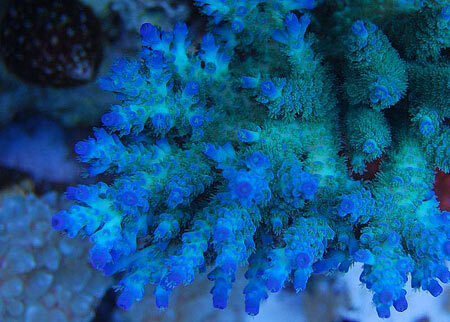 The next step was the purchase of 12,000K Reeflux bulbs, which was a compromise between the coloration and growth. 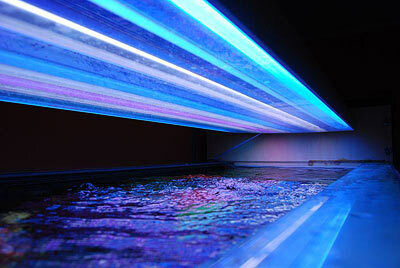 The last stage in the light selection was the decision to use T5 lighting as the only light source. Now I have an ATI Powermodule fixture that holds ten 80 watt bulbs, and with this solution I was able to turn the chiller off completely, since the emission of heat is incredibly low now. 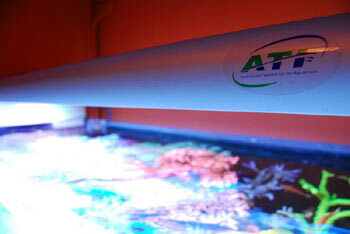 The quality of the ATI fixture itself is perfect and it is very functional. 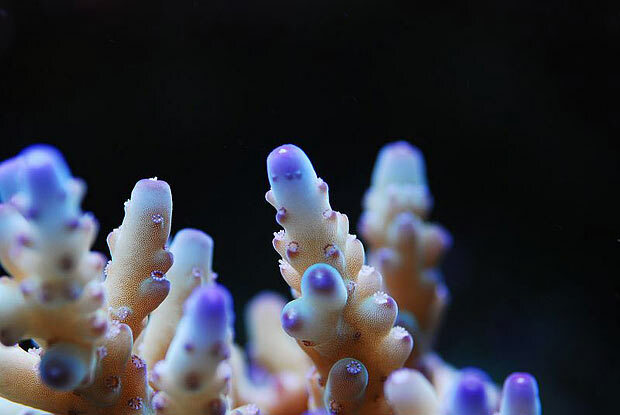 Out of the ten T5 bulbs I use only three white (ATI Blue Spezial), while the rest is a combination of blue and violet light (ATI Blue Plus, ATI Blue Actinic, and Korallenzucht Fiji Purple). 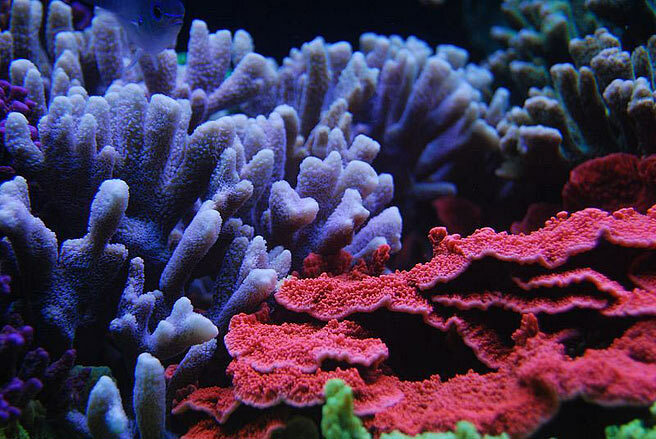 An unusual advantage of the T5 lighting is its nature - it illuminates more coral tissue, there is no shade, or shadows - the corals produce more pigment. The lamp is on for 12 hours a day. 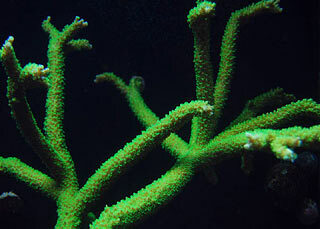 During the first 12 months, the calcium reactor was responsible for dosing the coral-building elements. The results were good, but sometimes the water parameters didn’t seem stable enough. 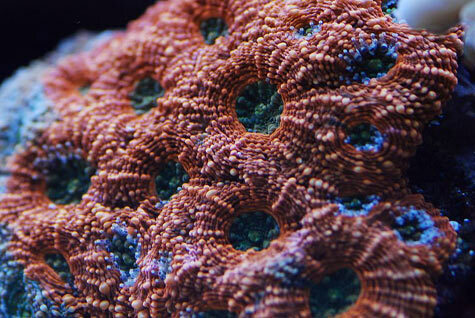 That is one of the worst things as far as SPS (small polyped stony) corals’ health is concerned. A few months ago I changed to the Balling method. * Now, three solutions are being dosed via a Grotech TEC III pump. 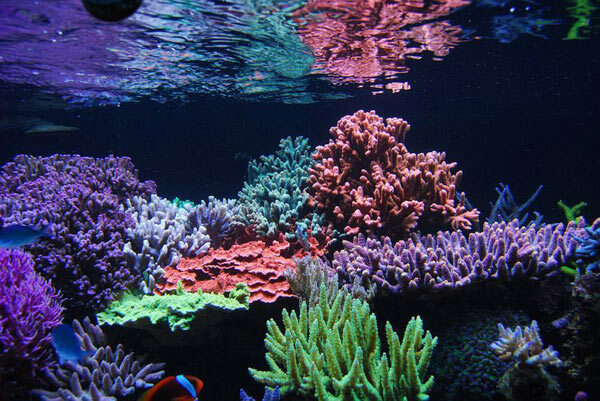 In my opinion, it is very convenient as all we have to do prior to ”the balling method” is measure the water parameters to determine corals’ daily demand for calcium and alkalinity and set up the dosing pumps accordingly. 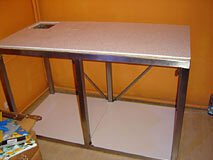 It guarantees 100% stability and, above all, peace of mind. Any possible changes in demand can be corrected quickly and trouble-free. Preparing the Balling solutions is no problem either; I use 29-liter (7.25-gallon) containers, so I can forget about it for a long time. 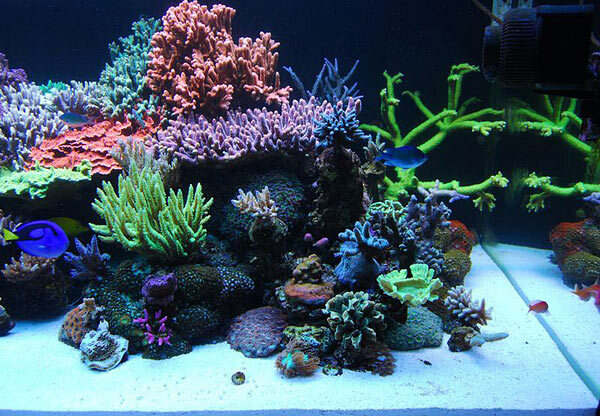 Making the decision to run a high-end tank, we have to be fully conscious of the never-ending work and observation that follows. The experience we gain on the way allows us to reconcile tank obligations with work, family and other hobbies (for me it’s fishing). 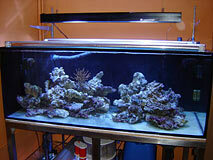 Twice a year I change the T5 bulbs, once a month I have to change the activated carbon and Rowaphos. 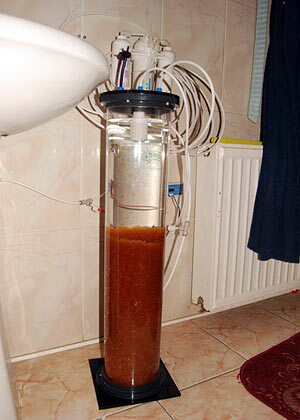 Once a week I also perform a 25-gallon water change - using the water from a RO/DI station made by my friend Rafal’s firm (THCSKIBA.PL) and “Preis” salt. 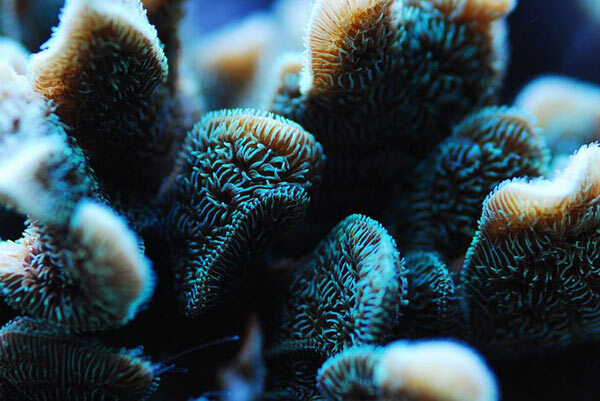 The corals are fed once or twice a week at night, dispensing well-mixed lobster eggs with vitamins and omega-3 acids, interchangeably with Prodibio’s Reefbooster superior coral food. 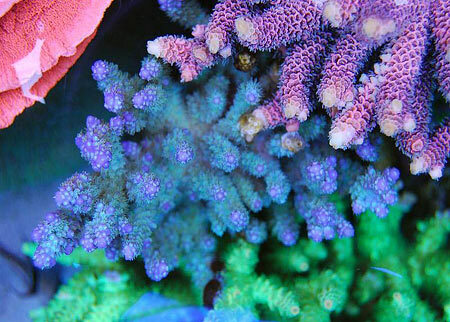 Daily dosing of amino acids and coralvitalizer (Korallenzucht) keeps the SPS color stable and pleasant to the eye. From time to time I use the dosing pumps to supply Grotech ABC Elements set. Recently I’ve been experimenting, and getting good results, with Zeospur2 (Korallenzucht) and iodine supplements, including those made by myself in my drugstore. Because of my absence while working, the fish are fed by my lovely mom, who really shares my passion. She gives various frozen foods and Cyclop-eeze a few times a day. 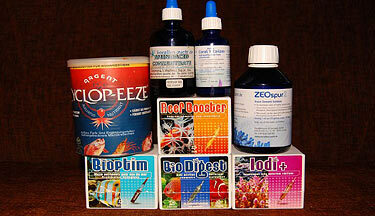 It’s worth mentioning that I use a Prodibio bacteria+bacteria food set. Regular dosing of these supplements significantly raises the filtering ability of the whole system. 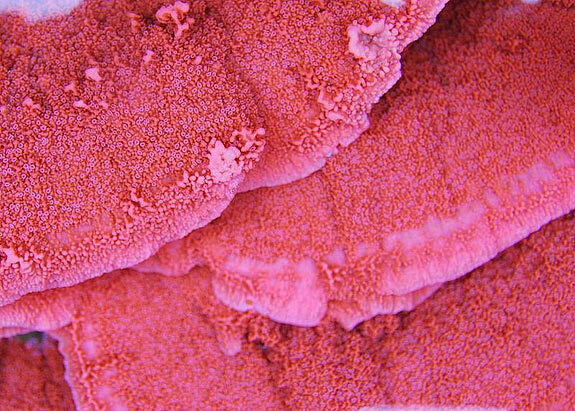 The bacteria diminish (or consume) nitrate and phosphate in a natural way, much like Zeovit does. 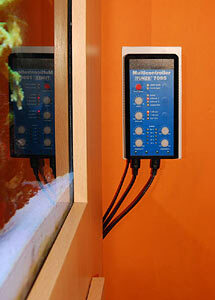 The tank status is simply monitored with an Aquamedic meter that provides redox potential and pH readings. I also need to say that my university education has been a great help in the running and maintenance of such a large tank. The patience and precision of a pharmacist, combined with a better understanding of chemistry, are always welcome in this hobby. 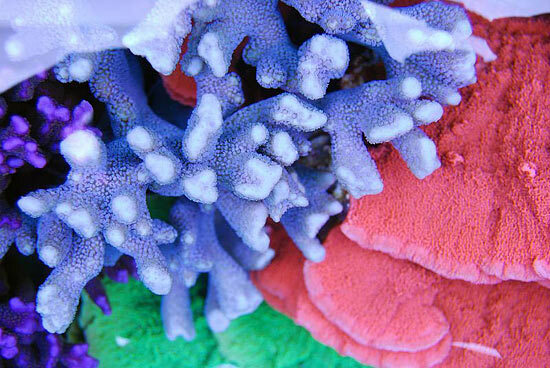 Today, the look of the tank is mainly determined by my true love for SPS corals. 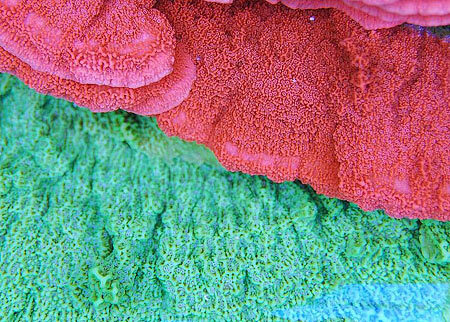 From the very beginning I was delighted at their variety of forms, shapes and colors. 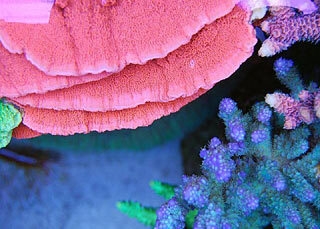 Those features provide unlimited possibilities with aquascaping. 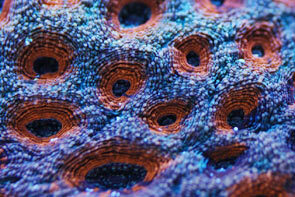 I have always wanted to create a tank that would not make a massive impression despite the big size of sps corals. 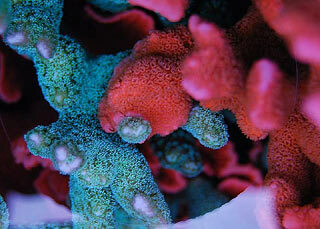 For me, the best style of aquascaping is when people form clear, well-preserved and sterile compositions. 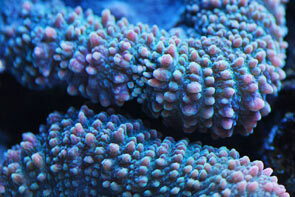 That is why I used a small amount of live rock to achieve an entirely spatial look. 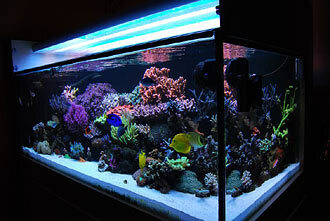 The whole effect has been helped by the correct lighting selection and live sand kept in good health. 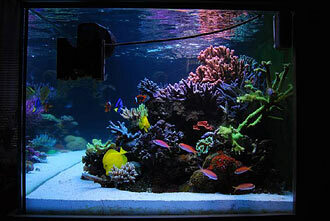 Now my attitude to reefkeeping is quite similar to bonsai art and the Amano-like freshwater aquascaping style. 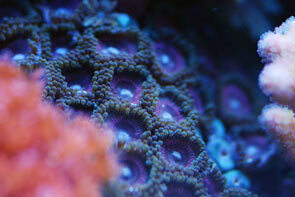 I won’t mention all the species of SPS corals in my tank; it is a side issue in describing a system. 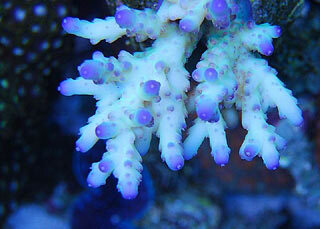 Like every SPS keeper, I have acropora, montipora, stylophora, pocillopora, porites and seriatopora. 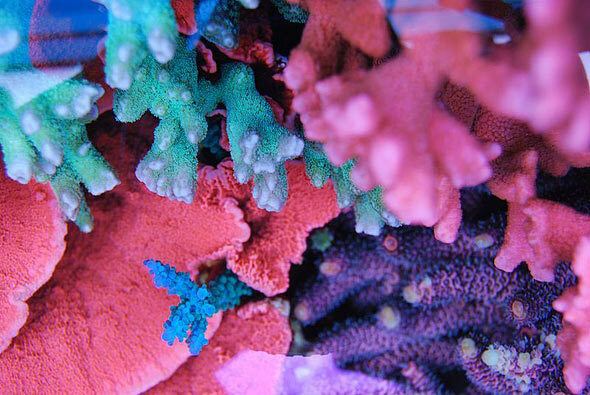 All of them have grown from small frags. 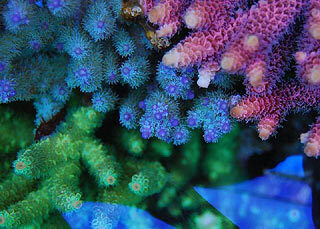 The lower parts of the tank are dedicated to some zoanthids, mushrooms, and some colorful LPS (large polyped stony) corals, which are uncontested ornaments. 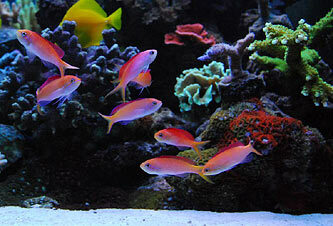 The fish in my tank are only an addition and they have never been the main goal of the system. 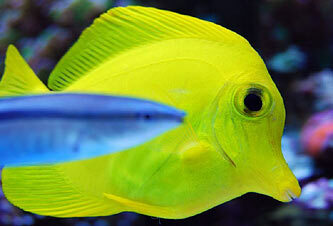 I have some tangs, chromis fish, anthias, apogons and amphiprions. 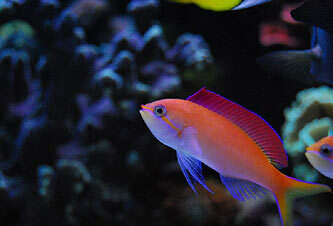 Recently, small school fish like anthias or chromis can make a bigger impression on me than big ones, like tangs or others. 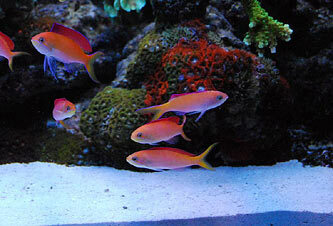 A shoal of anthias fish looks very delicate, which definitely responds to my aquaristic vision. 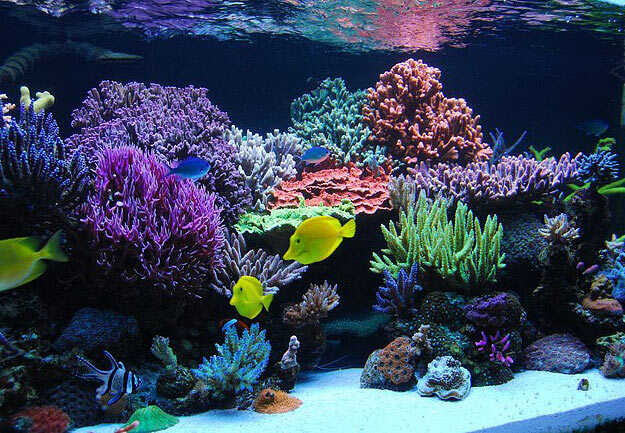 The tank evolution surely will go on to eliminate the tangs and other big fish, substituting them with schools of small treasures. 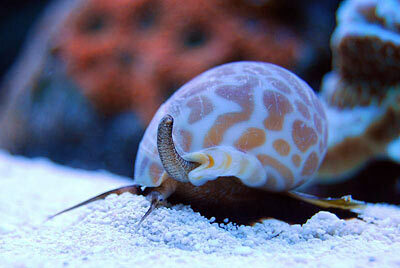 Others inhibitants are some cleaning and dancing shrimps, about 40 turbo snails to keep live rock clear of algae and some sandstars, strombus and brunnerus snails to keep live sand in good health. Advising all those new to the hobby, I will not write about patience as the most necessary aspect, as it obviously is, although equally if not more important, commitment. 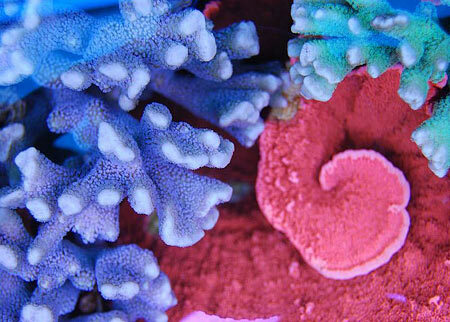 In the saltwater hobby, there is no room for half-measures, and we should put into it all our heart and soul. The passion should become a habit, an addiction that we have to learn to live with. 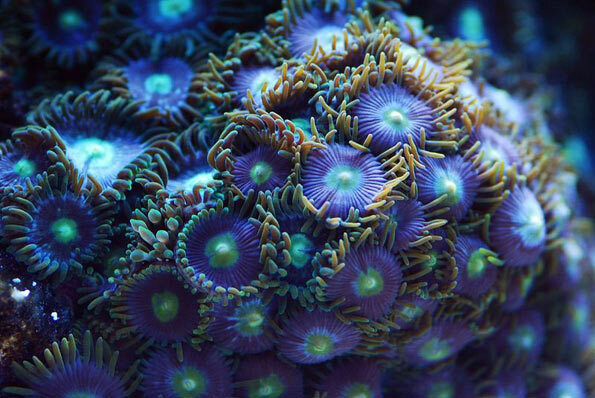 I would like to thank my parents for mental and often financial support, to my girlfriend Gosia for her understanding and empathy for my passion, my friends from the NANO-REEF.PL society (Pilot, Rako, Krzysiek, Lukasz Kur, Robert K, Seb, Walker, Przemek, Remik, Aquamaniac, Froolk and many others), to Andrzej Niewiarowski and Czarek Rebech for the exchange of priceless experience, discussed both in person and on the phone for hours. 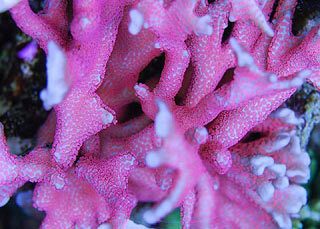 Special thanks for ZenonPl (language help) and BigWalker – for the camera lens for macro photograph. 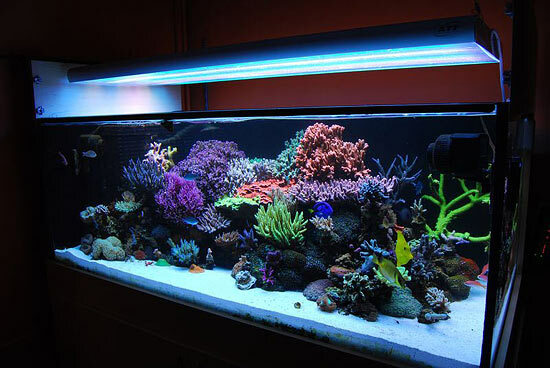 Also, I would like to thank the Reef Central & Team RC for noticing my tank and the opportunity to show it to the whole world. 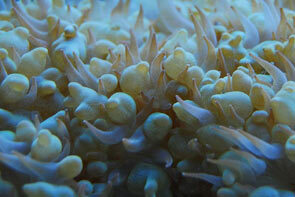 Photography – All pictures were taken by myself, with a Nikon D40x with various lenses, including a macro lens.